Cleaning your pool is important to ensure you and your loved one’s safety and comfort while you are using it. However, keeping its cleanliness is not that easy, but with the help of a good pool cleaner, such tedious task has become much easier. So, in this article, we present you our Polaris pool cleaner reviews. Among the pool cleaners from Polaris, the 5 below are the ones who have received the most positive reviews from the customers. With triple jets combined with advanced cleaning technology, this pool cleaner can help clean pools thoroughly by sweeping, scrubbing, and vacuuming it, regardless of whether you have an above ground pool or in-ground pool. Some of the Polaris 360 reviews online showed how customers love the fact that it comes with a feed hose (31 ft.) and a single chamber filter. They also love how this pool cleaner can free their pool from all kinds of debris. It works for all pool sizes and shapes. Not only does it clean the bottom of the pool, but it also cleans its walls. You don’t need to buy a booster pump to use it. It has a back-up valve that makes cleaning without pause possible. It does a great job of eliminating contaminants. It can get stuck on the steps. As one of the best pool cleaner, this one has a 31 ft. feed hose and a 1.5-inch pressure cleaner line. It also has an auto-reverse feature that prevents it from getting stuck or hang-up. Customers did not have a hard time using this pool cleaner as operating instructions are already included in the box. They are also very happy upon seeing how clean their pool was after using it. It has more torque that makes cleaning quicker. It features the TailSweep PRO that helps in cleaning the hard to reach places. It cleans even large debris. It does not spray water outside of the pool. It is a compact pool cleaner. A booster pump is needed for this pool cleaner. 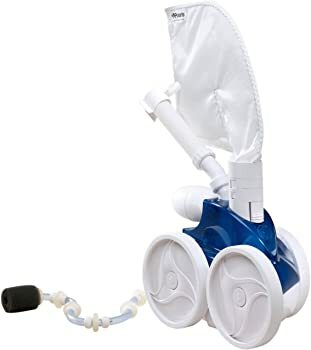 The Polaris F9450 is an in-ground pool cleaner that works on 4-wheels and comes together with an ultra-fine filter and a pleated scrubbing brush that scrubs even the tile line of the pool. It also has a lift system. Many customers have left positive Polaris 9450 reviews, saying that this pool cleaner cannot be compared to other pool cleaners in the market due to the fantastic and impressive job that it did in cleaning their pool. 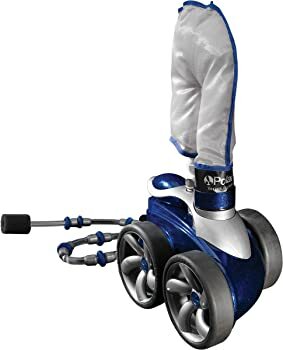 This robotic pool cleaner has a remote control. It has an all-purpose canister filter with a capacity that is bigger than other similar products in the market. It has a programmable timer. The canister filter is easy to clean and empty. You just need to shake and spray it. So, there is no need for you to touch the debris just to get it out of the canister filter. Its cleaning cycles can be customized. It can climb over obstacles without any problem. It can only clean pools that are up to 50 inches in length. With this pool’s vacuum technology, even the debris located in the tight corners of the pool can be easily cleaned. 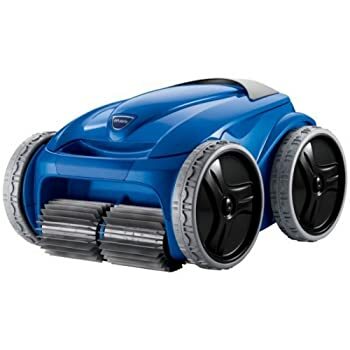 Also, like the other ones mentioned here in our Polaris robotic pool cleaner reviews, this one also comes with a remote control. 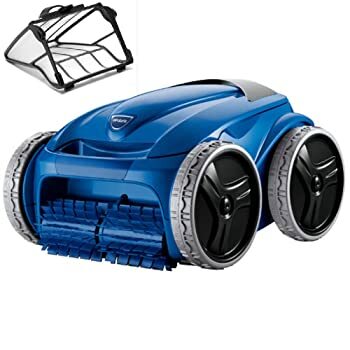 Polaris 9550 reviews say that this product is superior to others when it comes to its cleaning power, especially since it can even clean leaves, and it does the job quickly. Customers also noticed how easy it is to use and to remove from the pool. The tires that this pool cleaner has are suitable for different pool surfaces. It has an ActivMotion Sensor for easier pool navigation. It can clean debris even the ones under the stairs. It is easy to store and transport. It has pre-programmed patterns of cleaning. It flips over and gets tangled. 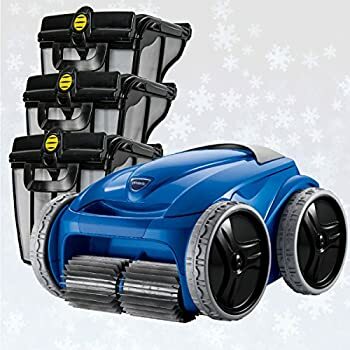 To complete our Polaris pool cleaner reviews, the All Season Polaris Pool Cleaner kit includes 1 extra leaf canister, all-purpose filter canister, fin mesh canister and the F9550 sport pool cleaner from Polaris. It also features an easy lift system. Customers are thankful to Polaris for offering a kit that contains almost everything that they need to make sure that every nook and cranny of their pool would be cleaned well. They also love how the transport caddy is easy to assemble and does not require the use of any tool. It can pick up stubborn debris. It has an indicator informing you that the canister is already dirty. This pool cleaner can climb and clean walls and steps. It has a solid-blade brush that scrubs tile line thoroughly. You can set the timer for this pool cleaner. You cannot control the speed of this pool cleaner. To end this article, we would like to declare Polaris F9450 as the best robotic pool cleaner, considering how it can clean even ultra-fine silt and sand. Also, it does not only clean pool walls and floors, but it cleans the tile line as well. It even has an ActivMotion Sensor that optimizes its cleaning capacity while reducing the tendency of cord tangling whenever it is in use. Polaris is one of the most known brands offering quality pool cleaners in the different parts of the world. So, if you are planning to buy one, you might as well consider buying from them.